Chicago’s 580 parks are littered with statues of historically significant men. Some of these men may be familiar to you: Nicolaus Copernicus, Benjamin Franklin, Abraham Lincoln. Others may be unfamiliar: Greene Vardiman Black, for example, the “father of modern dentistry.” While the accomplishments of these notable figures vary, their gender does not. In fact, there is not a single statue in Chicago that honors a historically significant woman. The lack of public statues honoring women has received recent attention in the local media, and for good reason. In a city home to such important female leaders like Ida B. Wells and Jane Addams, how can public depictions of women remain absent in Chicago’s parks? The Chicago Park District told WBEZ Chicago that this absence is an issue of timing; the heyday of public sculpture in the city occurred before women earned the right to vote and were therefore not involved in public life. Yet this argument does not explain why men continued to be honored in Chicago parks long after women earned the right to vote in 1920. As recently as 2006, the Chicago Park District has added a new bronze statue of a male figure to its expansive park system. 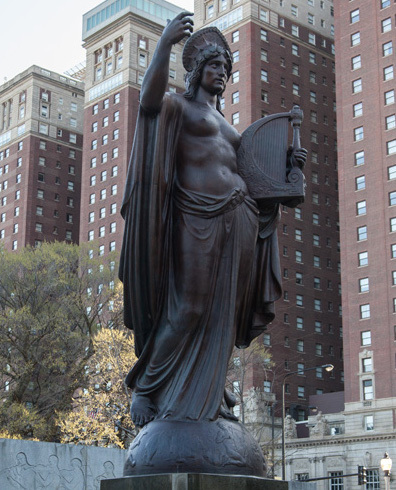 Second, the 1918 replica “Statue of the Republic” in Jackson Park – affectionately known as “Big Mary” or “The Gold Lady” – similarly depicts a gold-gilded goddess of Liberty and republican virtue. And finally, Chicago’s Oz Park is home to the 2007 statue of Dorothy from the beloved children’s story, The Wizard of Oz. The absence of real women in public sculpture is not unique to Chicago. In New York City’s Central Park, there are 22 statues of male figures and only 2 statues of female figures. 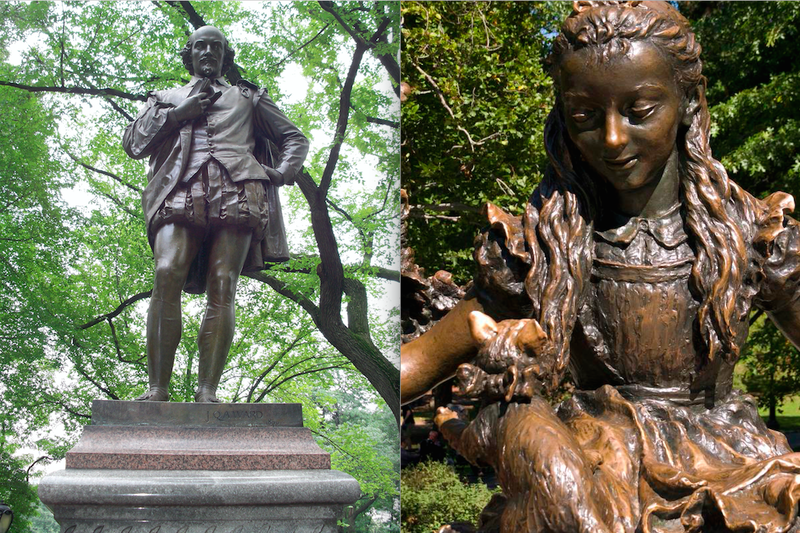 Like Chicago’s Dorothy, the 2 women represented in Central Park are fictional characters from children’s stories: Alice from Alice in Wonderland and Mother Goose. When compared to the nearby figures of Christopher Columbus and Alexander Hamilton, the statues of Alice and Mother Goose suggest that women have not contributed to history or, at the very least, that their contributions are entirely symbolic. They hint at the larger misconception that men are the sole agents of historical change. Why should this matter to public historians? It matters because sites associated with women’s history in cities like Chicago and New York have not always been preserved. Because of this, statues of historic women in public urban spaces like parks are essential to integrate women back into the built environment. In the last decade, the Chicago Park District has renamed over 40 parks after historically significant women. There is a recent effort in New York to correct the sculptural gender imbalance in Central Park and a current project in Chicago to build an Ida B. Wells monument in Bronzeville. These are important steps towards increasing the visibility of women’s history in the urban landscape. 2015 Loyola HGSA Conference CFP is Here! Excellent article! I’d also like to point out the Willard Fountain in Lincoln Park, which further illustrates your themes. It’s a decorative drinking fountain for people, horses, & pets featuring a bronze statue of a young “Fountain Girl” bearing a vessel of water. Like the others you pointed to, this representation is fictional and symbolic, but it was actually commissioned by women, acting through the WCTU, for the 1893 world fair — a case, it seems, of women actively using Victorian ideals of feminine childhood to make a public statement about temperance. The fountain was later moved to Lincoln Park and, remarkably, the statue was stolen in the 1950s, erasing even this rare bit of women’s history commemoration until a replica was installed in 2012. It might be interesting to see if women’s groups were involved in planning for any of the other statues in the city, male or female or abstract, and if so, what motivated or constrained their choices of figures. In any case, it’s clear this is a gap that needs closing! This is an effort to create a monument in honor of Ida B. Wells (journalist, civil rights activist, suffragist). People can contribute to the online campaign through October. Let’s all contribute to make the first monument in Chicago to an African American woman happen! Thank you for the link Michelle, we can’t wait to see this project come to fruition! Alice and Dorothy — two protagonists in children’s literature that still influence the lives and minds of children today, and even adults! Statutes depicting Alice and Dorothy reflect historical shifts in not only children’s literature, but children’s lives. For years in Western society, before the Renaissance, through the Renaissance, and even through parts of the nineteenth-century, children faced infanticide, early death, brutal labor conditions, etc. etc. as they grew up with the expectation of being a small adult. Literacy, apprenticeships, and education also did not apply to girls, they applied to boys. Alice and Wonderland as a children’s book speaks to a shift in children’s literature. Until that point, protagonists in children’s literature who also happened to be girls, did not just adventure about in books or occupy extremely fantastical spaces of the reader’s imagination. Dorothy in the Wizard of Oz, operates in much the same way, and she like Alice journeys back to her adventure spaces. These statues underscore a related history – that of the child. What does it mean to be a child in an urban setting? What spaces are children allowed into? Who allows children in? What spaces do children claim as their own? What does it mean to grow up with access to a park that includes a statue from a children’s book? What parks receive these statues? Which ones don’t? These are questions I think about. So, while Alice and Dorothy are fictional and children, that does not discredit them or their statues. Yes, there need to be more statues of women. Most certainly! Especially of women who championed historic local and national changes, such as Ida B. Wells, Jane Addams, Emma Goldman who rests in peace outside the city, and the list goes on and on. And, it is telling that many statues of the “Other” gender come from children’s literature or the national imagination. But, Alice and Dorothy have a place too, and I believe cities need more statutes like them. Children need bridges to their backs, all children, not just on Chicago’s Northeast Side, but Chicago’s South Side and West Side. Every child, everywhere.